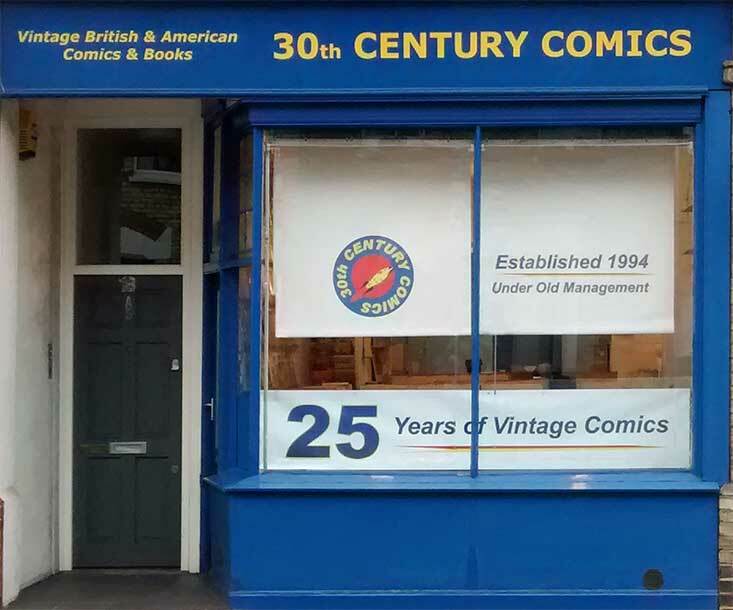 Welcome to 30th Century Comics, specialists in old, vintage American & British comics, annuals and books. We were established in 1994 and operate from our retail shop in Putney, South West London. We believe we are unique worldwide in that we deal extensively in American & British comics, annuals and books from 1900 to the 1980s (and beyond) and have a full time shop on two floors with well over 100,000 items in stock and all on display for collectors to browse and buy. Our entire vintage stock catalogue is online and also available by mail order; simply click on the Catalogue Index link to access the index to our stock and then browse the category(ies) of your choice. There are hundreds of cover images of vintage items, which may be easily accessed in the catalogue. Our catalogue is updated every week with hundreds of new arrivals. Sold items are deleted as frequently as time allows. Our What’s New page tells you what we’ve added and when. You may also keep informed of our incoming stock by signing up for our weekly email Newsletter, using the link in the menu on the left. In addition to our catalogue listings, we also stock tens of thousands of American comics from the 1980s right up to a few years ago. These are all available for shop visitors to browse and buy. Boring Legal Requirement Section: 30th Century Comics is owned and run by Robert Rudderham, William Howard Morgan and James ‘Sandy’ McCaughey. We’re sure you’ll all be thrilled to know that we’re registered for VAT, our registration number being 662 5728 17.